The Euphrates valley in Syria is a key area for understanding the agricultural revolution as well as the development of early cities. 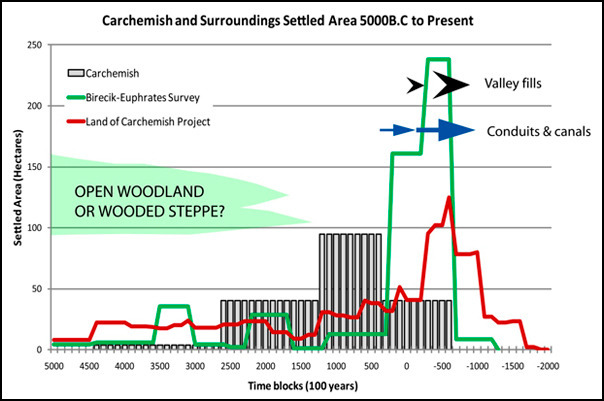 However, large areas of that landscape appear to be missing, and a principal aim of the Land of Carchemish (Syria) project is to reconstruct the Euphrates Valley and neighbouring landscapes with a view to understanding long-term trends in settlement. The survey has been recording surface archaeology as well as prospecting for buried sites that relate to the urbanization of Carchemish and Jerablus Tahtani, as well as to the development of the region since the Neolithic. The Project, conducted by Professor Tony Wilkinson (Dept of Archaeology, Durham University) in collaboration with Professor Edgar Peltenburg (Department of Archaeology, University of Edinburgh), is being conducted in collaboration with the Directorate General of Antiquities, Damascus, and is funded by the Council for British Research in the Levant and the British Academy. The project builds upon Professor Peltenburg’s Tell Jerablus Tahtani Project as well as the landscape studies of Professor Wilkinson, which have been undertaken along the Euphrates in Syria and Turkey and published in the Series, Oriental Institute Publications. The field seasons, from 2006-2010, demonstrate that the tell-based settlement of the Early Bronze Age was dominated by Carchemish on the Turkish-Syrian border, although it remains unclear as to the size of the city during the Early Bronze Age. Nevertheless, by Roman / Byzantine times this tell-based landscape had been progressively replaced by a settlement pattern of villages and farmsteads which were dispersed widely across the landscape. This remarkably “busy” landscape was associated with numerous canals, qanats, and masonry channels, as well as quarries and evidence for intensive agriculture. Publications of this project have appeared in the Journal Levant (2007 & 2012), published by the Council for British Research in the Levant. Surveys have also covered the lower town of the city of Carchemish, 40% of which lies within Syria. In the survey of Carchemish we have demonstrated the extent of Iron Age occupation of the Outer Town, as well as the scale of the ramparts and the existence of what appears an earlier phase of rampart construction within the Outer Town. Because of the ongoing conflict in Syria, the team is unable to get access to the site, but they are currently working on the production of a volume of papers devoted to Carchemish and its landscape. The volume Carchemish in Context is expected to be published by BANEA and Oxbow books. An interim report on the Outer Town of Carchemish appears in Antiquity Bulletin (2011). Peltenburg E. & Wilkinson T.J., (2008), Jerablus and the land of Carchemish: Excavation and survey in Syria, Current World Archaeology 27: 24‐32. 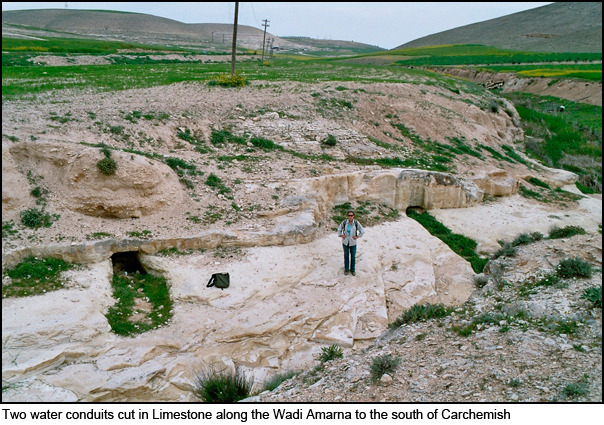 Wilkinson T.J. & Peltenburg E., (2009), Archaeological Surveys in the Land of Carchemish, Syria, 2009, CBRL Bulletin 4: 33‐38. Wilkinson T.J. & Peltenburg E., (2010), Carchemish in Context: Surveys in the Hinterland of a Major Iron Age City, CBRL Bulletin 5: 11‐21. Eleanor Barbanes Wilkinson, T.J. Wilkinson & Edgar Peltenburg (2011) Revisiting Carchemish: the Land of Carchemish Project in Syria, 2009 & 2010. Antiquity Project Gallery - Issue 329, September 2011. Peltenburg E., Wilkinson T.J., Ricci A., Lawrence D., McCarthy A., Wilkinson E.B., Newson P., Perini S., (2012), The Land of Carchemish (Syria) Project: The Sajur Triangle, in Curtis J., Fletcher A., Glatz C., Matthews R., Seymour M., Simpson J., Taylor H. (eds), Proceedings of the 7th ICAANE Conference held in London in 2010, Harrassowitz, Wiesbaden: 191‐204. Wilkinson,T.J., Nikolaos Galiatsatos, Dan Lawrence, Andrea Ricci, Rob Dunford and Graham Philip. (2012). Late Chalcolithic and Early Bronze Age Landscapes of Settlement and Mobility in the Middle Euphrates: A Reassessment Levant 44 (2): 139-185. For further information, please contact Professor Tony Wilkinson.